At the RLG Partnership Annual Meeting in 2007, Timothy Burke told the assembled research librarians ‘you have to figure out how to be hydraulic engineers of information flow rather than the guardians of the fortress’. It’s an image that has stuck with me. Everywhere now in our professional literature we see the challenges of our work represented by the imagery of flow and fluidity. 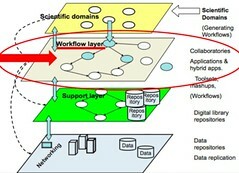 We try to scope and identify workflows that are changing or need to change. The platform of the web dips and peaks faster and differently than we can predict, and as it does so content suddenly flows in different directions, taking new channels. Stability in this environment is rare, and a relief when we find it, even though it may lie in places that librarians take some time to trust – like Google and Wikipedia. I often show a slide produced by Rick Luce, Vice-Provost and Director of Libraries at Emory University, when describing the territory of our Research Information Management (RIM) programme. This appeals to me because it indicates that library attention needs to be focused on the workflow layer, rather than the repository layer that sits below it. In RIM we talk about the environments that surround researchers, the need for libraries to be aware of them, and the ways in which they operate as sources of pressure upon researchers, as well as providers of benefit to them in their research and their careers. We use the following model to represent these environments at a broad level. The debate will go on. Libraries need to fathom this sea-change in the climate, as it produces something rich and strange. Studies like the one produced by RIN, and a group emerging from our RIM programme, are essential. One of the most recent outputs from that programme was our Academic Library Manifesto described by Ricky here. Note its first injunction: Commit to continual study of the ever-changing work patterns and needs of researchers.